Before leaving the great state of Illinois I had the pleasure of visiting a local liquor store and marveling at the selection of beers that are not available to us in New York thanks to the bizarre and cryptic world of beer distribution. 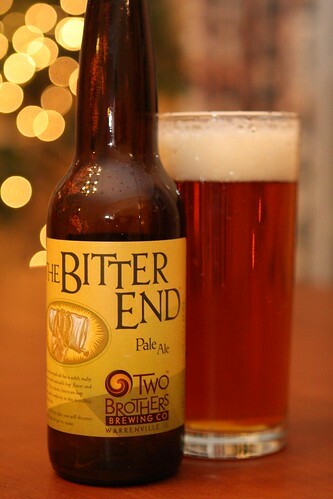 I did, however, have a chance to have have this beer, The Bitter End, by Two Brothers Brewing Company, just down the street from where my in-laws live. This beer is actually available in New York but you know what they say: when in DuPage County, drink like the DuPagians. After the short flight to LaGuardia we returned to a beginning-of-the-year classic. Every year we start off with a freezer so full that it will not stay shut without the use of some sort of foreign object such as a broom handle. 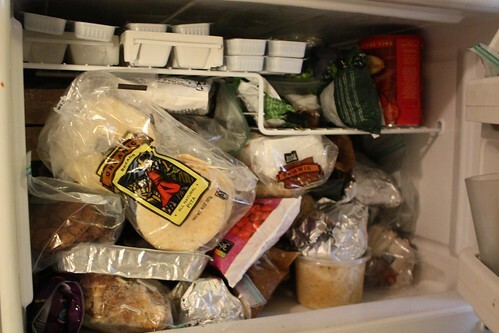 After the constant rushing of the holidays it's always nice to settle back and focus on one relaxing task: cleaning out our freezer. It's also something of a game to see how little we can spend on groceries in the month of January as we move through our inventory. 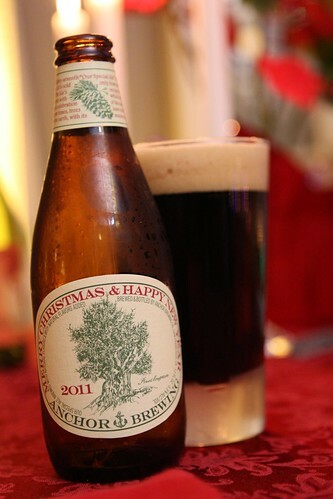 To celebrate our homecoming I had another late Christmas beer, this Merry Christmas & Happy New Year 2011 from Anchor Brewing. The recipe for this beer is top secret and changes every year. I know far too little about beer to be able to be able to reverse engineer so all I can tell you is that it was different than I expected, spiced, dark, and quite nice. For dinner I made a cabbage soup which essentially used up all fresh produce in the crisper along with some miscellaneous items from the freezer. I rendered some bacon in olive oil then added crushed garlic, anchovy, onion, carrot, celery, cabbage, potato, turkey stock from the freezer, salt, and pepper. When it was done I topped it with some toasted bread, Parmigiano-Reggiano, and fried sage leaves, drizzling the remaining olive oil and butter over the top. Two things I love about the winter: winter beer and winter stew. Sure it was only 35 degrees tonight but winter is upon us. 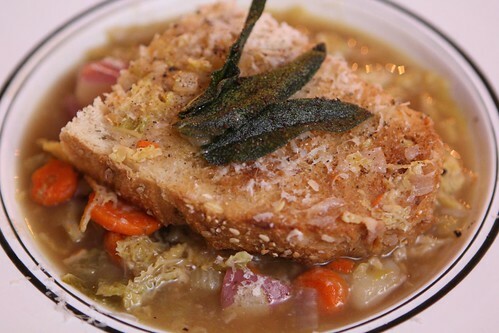 It is the season for dark winter ales and hearty soups and stews! And cleaning out the damned freezer!